Here are a few ideas to produce less rubbish and more cheer. If you were to look at some of the most popular toys over the decades, you’d find the majority were made of plastic and wrapped in plastic – and then were probably wrapped in paper and bows. “We know we live in a consumer culture, but it goes into overdrive over the holidays,” says Anne-Marie Bonneau, the California blogger known as the Zero-Waste Chef. 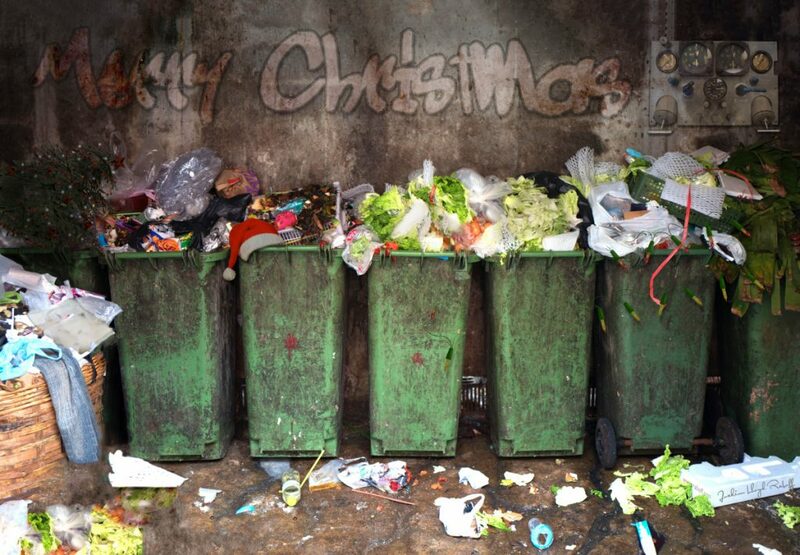 What happens to all that plastic and waste after the carols are done and the food is eaten? According to the Environment Protection Agency, 8.8 million tons of plastic ends up in the ocean every year. Holiday excess isn’t limited to plastic toys and plastic wrap, though. Every year, Americans throw out an incredible amount of food – about 200 million pounds of turkey meat over Thanksgiving alone, according to the Natural Resources Defense Council, an environmental advocacy nonprofit. Disposable wrapping paper, cheap decorations, fake trees, white elephant exchanges, cards, cookie packaging – it can all seem like too much, especially to folks who try to cut down their waste year-round. So, we asked a few zero-waste bloggers for tried-and-true advice on reining in the holiday excess. • Calculate portions: Use the “Guest-imator” to better calculate how much food to make. The calculator at savethefood.com, by the Natural Resources Defense Council, allows you to choose the number of guests and consider how much they’ll eat (small, average or big eater), then plug in how many leftover meals you’d like. Select from a “Classic Dinner Party” (meal and dessert), “Veggie Paradise” (vegetarian options) or “Smorgasbord” (a variety of options), and the calculator can help you come up with a menu – including how many servings of each to make. Before a holiday meal, try to eat out your fridge, freezer and pantry, Bonneau says, to make room for cooking ingredients. Then, after the meal, use the leftover ingredients to make other meals, such as turkey sandwiches for lunch and turkey tetrazzini for dinner the next night. “If you’re buying celery for the stuffing, and you have more, put it out with peanut butter for snacks the next day,” Ristow says. If you can, compost whatever is left. • Buy useful items and experiences: Siobhan McComb, in Bothell, Washington, of the blog One Glass Jar, tries to get items her two kids need, such as underwear and socks, as well as one item they want. McComb’s family also chooses one excursion to do together over the holidays. One year, they went to nearby mountains for sledding and horse-drawn sleigh rides. For friends and family, McComb asks people what they really want, not minding if that ruins the surprise. • Look for secondhand gifts: McComb scours consignment, charity and thrift shops for items on loved ones’ lists. For example, “If someone wants an iPhone, find a factory-repaired and reset iPhone, and then you don’t have to buy something new,” McComb says. • Rethink stocking stuffers: Look for local soap from a holiday bazaar, McComb suggests. Or, “I bring my own little bags to the bulk departments and I buy chocolates and candies and put them into stockings.” She’ll throw in bulk nuts, oranges and even practical items such as bamboo toothbrushes from Brush With Bamboo (the toothbrushes and packaging are compostable). Many people also use reusable cloth gift bags. McComb suggests compostable tape, too. Ristow suggests keeping nice boxes with lids in the closet, ready for gifts collected throughout the year. • Make natural decorations: McComb decorates and redecorates a twisted grapevine wreath each year: “I load it with greenery from around our neighborhood … little cedar clippings and fir clippings … and dried leaves.” For the tree inside, and for one in their yard, her family makes garlands from dried orange slices, popcorn and cranberries. Around the rest of the house, she’ll use evergreen swag, which later can go into the compost or yard-waste bin. • Use precious serving dishes: That china and silverware in the hutch is meant to be used and is far more festive than any printed paper plate or napkin.